There's lots of reasons to love receiving dividends from your portfolio. For starters they are a truly passive income source. You don't have to go around making sales calls or doing paperwork for the company. All you have to do is invest in some of the best companies in the world and collect the checks. Even better is that many companies increase their dividend payment each year which is a nice bonus since it means you get to collect even more money just for having an ownership stake. A passive income source that tends to grow each year is right in the wheelhouse of those that are pursuing financial independence. Financial independence is when your dividends, or other passive income sources, are higher than your expenses. That gives you the freedom to pursue whatever it is your heart desires. Whether it's writing the next great American novel, volunteering, spending time with family, doing extensive travelling, changing careers to something that might be more emotionally rewarding but not as financially rewarding as you need for your lifestyle. The possibilities really are endless whenever your expenses are covered without having to commit 1/3 or more of your day to work. I've written before about requiring a margin of safety for financial independence as well as that magical crossover point. So just a quick recap on those two. The crossover point is simple. 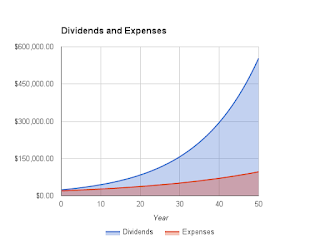 Just divide your dividends by your expenses. Anything over 1 and you've already passed your crossover point. Congratulations! The margin of safety comes in to play because eventually there's going to be a hiccup with your plan. Either a company you own or an entire sector has to reduce or cut their dividends. Or expenses creep up higher than you expected. That's why we need to have a margin of safety. It's similar to the diversification concept where you invest in multiple companies just to reduce the risk that any one of them might run into big trouble. For those that reach the promised land of financial independence I can't think of anything worse than having to go back into the workforce just because you didn't have a margin of safety in case things go wrong. The historical dividend growth rate of the market as a whole is around 6.5% per year. That's great because it means your passive income continues to grow. Unfortunately, inflation does the same thing for our expenses. Granted there's an argument that your expenses could decrease rather than increase over the short term but over the long term they will trend higher just due to the cost of your basic necessities rising each year. 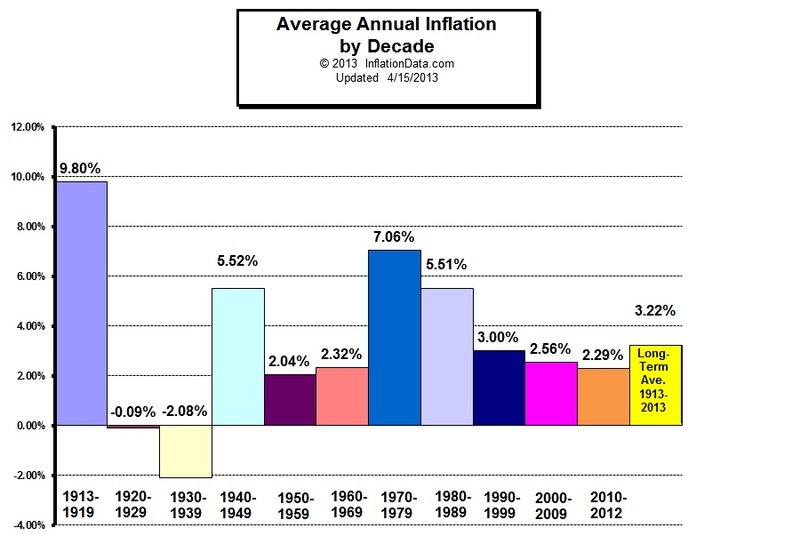 Inflation has been all over the place since 1913 with some decades showing high single digit annual inflation and others showing deflation. 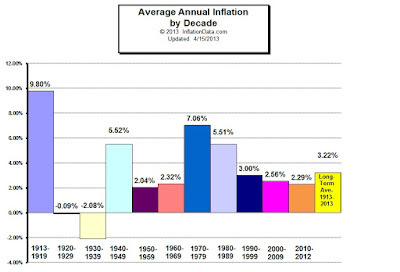 However, since 1990 inflation has been relatively stable and since 1913 the average annual inflation rate is 3.22%. Inflation could easily rear its ugly head with money printing from just about every central bank around the world, but so far it's been kept in check. So how do inflation, dividend growth and margin of safety tie together? Inflation and dividend growth make sense. They're both annual growth rates of the two factors involved in calculating your margin of safety. 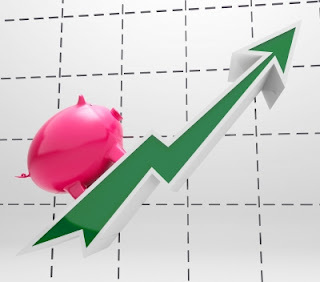 The wonderful thing about dividend growth investing is that as long as your dividend growth is higher than the inflation rate you're building up purchasing power and increasing your margin of safety. Originally my plan was to completely call it quits once my dividends provided an adequate margin of safety over my expenses. However, as time has gone on I'm likely to continue earning income both through writing and a likely part time job in another industry or at a small business thus requiring a smaller margin of safety for me to be comfortable. Let's stick with the original plan though for an example. If I were to support myself solely through dividends that I receive I would require at least a 20% margin of safety. The margin of safety could come down a bit if I had a large cash buffer to help through the beginning years. So a margin of safety of 20% would mean that dividends are 1.2 times the amount of my annual expenses. That would provide adequate coverage in case something goes wrong and there's dividend cuts/freezes/suspensions as well as provide excess cash flow to still invest each year to further build up the portfolio. When the dividends grow faster than inflation your margin of safety/coverage ratio grows. Let's assume your annual expenses the first year you reach financial independence and leave your job is $20,000. Luckily you've been doing a great job saving, investing, and growing your portfolio while you worked and your portfolio now provides you with $24,000 in annual dividends. So your starting margin of safety is 20% ($24,000 / $20,000 = 1.2). Assuming average dividend growth of 6.50% and average expense inflation of 3.22% per year your coverage ratio will continue to expand year after year. After just the first year it would increase from 1.20 to 1.24. Year 5 would see it grow up to 1.40. Year 10 looks even better at 1.64. By year 17 your dividends would be twice what your expenses would be. The follow graph shows the growth of dividends and expenses over 50 years assuming all dividends are spent or kept in cash each year. That's the power of dividend growth investing. Your dividends continue to grow each year whether you're actively growing them or not. Requiring a margin of safety is imperative to those seeking to live solely off of their dividends. However, within a few years that margin of safety will continue to grow thanks to the power of dividend growth. Dividend growth in excess of inflation will provide even more capital to invest, excess savings, slight lifestyle increases, gifts to children/grandchildren, or donations to charity. I've created a Google sheet if you want to play around with the numbers to see how you stack up. You can access the spreadsheet here. Really enjoyed the inflation graph. Didn't think it was that variable. I was wondering how much longer the 20% buffer adds to your FI time-frame? I was quite surprised at the variance in inflation as well but it looks like it's been more stable over the last 25 years. Of course that doesn't mean it can't spike up, especially after all of the money printing around the world. Our time frame to FI has been a moving target. Expenses have drastically changed since we first started on the journey, sadly in the wrong direction. It's something that we need to sit down and figure out to get rough estimates of a timeline. There's so many different variables at play because my wife might or might not work which drastically change our requirements. I still expect to earn income through writing/blogging and likely through part time or much more scaled back work with a much better work/life balance. There's also the possibility of accessing retirement accounts to help bridge the income gap. Lots of moving parts that we need to put some pen to paper and figure out our new plan. Sounds like a post idea. But to answer your previous question here's the answer along with the assumptions. Through dividend growth alone is would add an additional 7 years. If you continue investing then it'll be quicker. With $18k in annual investments ($1,500 per month) here's how many years it would take in addition to the regular dividend growth. Once you get to that point you'd probably be better off looking for alternative funding methods and just let the dividends grow on their own. A high cash buffer would likely get you to FI quicker while you let your dividends compound. Very nice article. There's a reason why Lowell Miller calls dividend growth stocks "The Single Best Investment". I have to agree with Mr. Miller. Thanks for the article JC. Margin of Safety is huge. Dividend Growth Investing is wonderful and life changing. I can attest to that. Hope all is well my friend and have fun over the holidays bud. Cheers JC. If you don't like receiving income while not doing work then I'm not really sure what's wrong with you. The margin of safety is a huge factor as many DGI bloggers, myself included, witnessed last week with KMI's dividend cut. Passive income is great, as you point out... you don't have to do anything special to receive the income, except, of course, to own stocks of dividend paying companies. The aspect of DGI that I like most, though, is the idea of "perpetual" income. If your portfolio generates, on average, $1,000 of dividend income per month, it means you can expect to receive $12,000 every year for ever and ever (assuming no dividend decreases or increases, of course). I really liked this article JC. Interesting to see what you've done with your DGI and the nifty little form you put in is really helpful! Considering your margin of safety is, as you say, very important on your way toward financial independence.